The phylogenetic tree of life has evolved along with our knowledge of biology and has changed quite a bit recently, as genetic data has been added to the descriptive work of zoologists, but the branch labeled "protists" has been especially problematic. What is a protist, exactly? The answer seems to be, "everything that is not obviously something else." The term Protista was introduced in 1866 by Ernst Haeckel, the same man who gave us the provocative but not quite correct theory that "ontogeny recapitulates phylogeny" as well as some astonishingly beautiful paintings illustrating his zoological theories. Haeckel conceived the protist category as a kingdom of lower forms separate from animals and plants, comprising basically all microorganisms. Bacteria and Archaea, however, were kicked out of the protist kingdom when the separation between eukaryotes and prokaryotes was established in the 20th century. 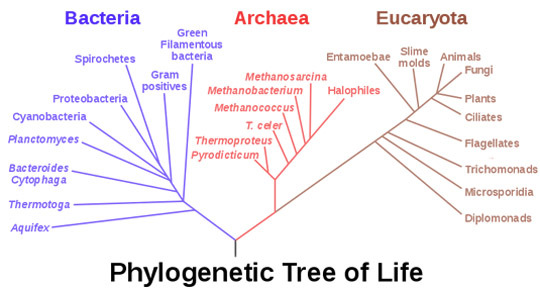 The modern biology textbook now generally gives us a tree of life with three domains—Archaea, Bacteria, and Eukaryota—and confidently jutting out from the Eukaryota are four kingdoms: plants, fungi, animals, and protists. There is, to be sure, an astonishing diversity in all four kingdoms, but it is usually easy to distinguish a plant from an animal from a mushroom. Protists, however, have expanded beyond the simple organisms in Haeckel's original conception to become a ridiculously polymorphic category; included among them are tiny slime molds that live among rotting leaves, the Plasmodium parasites that infect our red blood cells and cause malaria, and the giant kelp that wave their fronds back and forth in the sea waves. Where is the similarity? Lynn Margulis and Karlene Schwartz, in their book The Five Kingdoms (W.H. Freeman, 1998), struggled heroically to justify the Protista (they preferred the term Protoctista) kingdom. "Undulipodia (aka flagella) were present in common ancestors to all the phyla, even before mitochondria, given that the anaerobic archaeprotists bear them." However, a sentence later they admit that "in some phyla, all members bear undulipodia, in other phyla, they are absent..." It seems a shaky foundation on which to build a kingdom. All human cells are fathered ultimately by sperm, which bear undulipodia, but no one has suggested that humans are therefore protists. Genomics has made it clear that far from being a single kingdom, the protists are a phylogenetically diverse group. But the alternative to grouping them together is to separate them into tiny fiefdoms, each of which is equivalent on the tree of Eukaryota to what appear from our perspective to be the more significant kingdoms. Carl Woese's ribosomal RNA-based phylogenetic tree has branches for slime molds, Entamoeba (amoeba), ciliates (protozoa), flagellates (e.g., trypanosomes), trichomonads, microsporidia, and diplomonads (e.g., giardia), in addition to the usual animals, plants, and fungi. In 2005, the International Society of Protistologists divided Eukaryota into six different "supergroups" but controversy immediately erupted as to whether the categories reflected phylogenetic reality. The fracturing of kingdom Protista into a plethora of principalities is a pedagogical nightmare and a headache for zoology students everywhere. The effort to understand the incredible diversity of life remains one of the most difficult tasks that humans have undertaken.